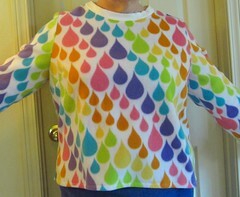 That’s what the fabric looks like to me, anyway. It’s called “Paperweight,” so that may have been what The Fabulous Mr. Fassett had in mind, too. If you’ll recall, my plan was to use two old Butterick patterns for this dress: 6760 for most of it, plus the slash pockets from 3569. The pocket modification was ridiculously easy–I just cut out the two extra pieces from 3569, folded down the top outside corner of the front skirt piece to match the one from 3569, and used the 3569 instructions to assemble the pocket. I tinkered with the fit on this dress for a while, and somewhere in the middle of that process, I realized that I was putting the dress on and taking it off over my head with the bodice pinned shut–and wasn’t having any trouble doing that. So I took the lazy route and didn’t do buttonholes, just sewed the buttons through all the layers. And I had eight of these shiny black buttons in the stash, so I just used them all. I’ve got PLENTY of single black buttons that I’ve been holding onto for years and will probably never use, and I’m not adding to them. The fit on the bodice was a problem, and I’m still not completely satisfied with it. 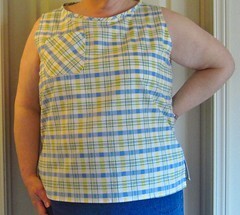 The neckline was too high, which I probably should have anticipated, given that it’s meant to work with a shirt collar. 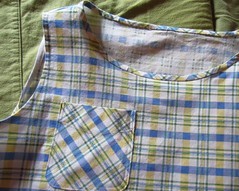 The folded-down edges help with that, but I suspect a collar would have been better. Also, the shoulders are dropped slightly, which is not a great look for me. I have taken them up a bit and added shoulder pads, which helps. I may be overthinking this, though, because the bodice looks pretty good in the pics. Maybe I’ve just been looking at it too long? I’m also kicking around the idea of adding fisheye darts in the back, as there’s a little bit more fabric there than I’d like. I think I’m going to wear it a few times before I decide on that, though. In the meantime, though, this is a really comfy, fun dress, and I’m going to enjoy wearing it. I love, love, love all the gorgeous color in this fabric and wearing the dress is going to be fun just for that reason alone. This is finish #3 for the Q1 2016 Finish-Along. Yay me!